The Avenue Hotel Bed and Breakfast offers a unique boutique hotel experience for adults looking for an alternative to a hotel getaway. 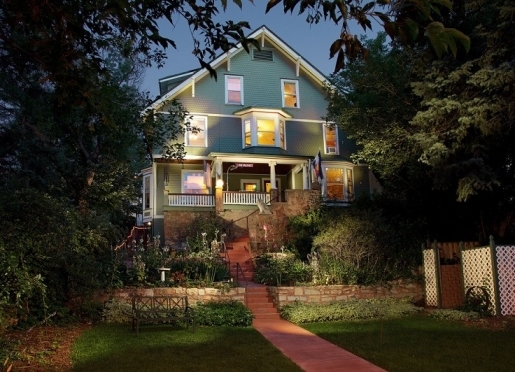 Located in the historic district of downtown Manitou Springs CO, is a Victorian boarding house built in 1886. Local shops restaurants and galleries are just out our front door with hiking in Pike National Forest behind us. 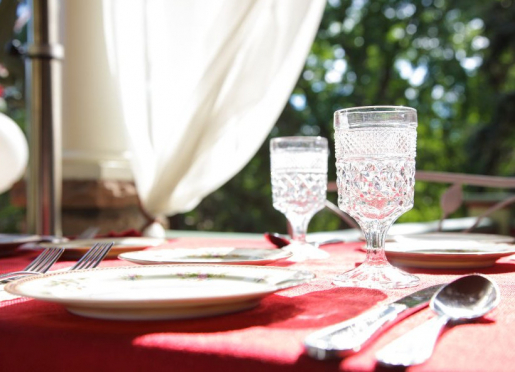 We have the perfect location for a your Colorado vacation, family reunion, group gatherings, a birthday party, romantic retreat, anniversary or just a weekend getaway. Travelers are always looking for memorable and relaxing experiences. Let’s discover more through the words of our innkeepers. 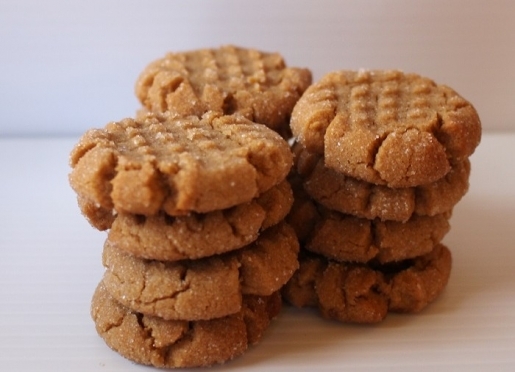 Many thanks to Gwenn David & Randy Hodges for sharing their secrets with BBOnline.com! Most travelers stay at the Avenue because of our central location. We are in the historic downtown of Manitou Springs, so we are close to all of the fun events that go on around town all year long. There’s Tuesday night lawn concerts on the library lawn next store and we serve wine and cheese to our guests on the front porch. We are surrounded by numerous restaurants so people never have to leave to eat. We are surrounded by art galleries that have amazing openings and there is the 3rd Friday Art Walks. We are also close to wonderful attractions and destinations like America’s most visited mountain, Pikes Peak, Garden of the Gods, the Cliff Dwellings, the Cave of the Winds, and numerous other hiking trails. 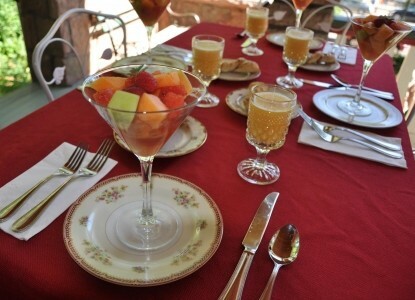 We are most known for our elegant accommodations, wonderful breakfast made from scratch every morning, and very inviting innkeepers and staff. We strive to make you feel at home. Another very popular thing amongst our guests is the Victorian appeal of the house. It is rich with historic nostalgia especially since it is nestled in the heart of historic downtown Manitou. People usually come to Manitou for the mountains or they want the small town feel instead of staying in one of the bigger cities like Colorado Springs or Denver. The best compliment we have received, and have received numerous times, about the inn is that people just want to move in and never leave! The best kept secret in our area would have to be our wonderful small Victorian town. Most people are looking at staying in Colorado Springs but we are just under Pikes Peak and not as well known. We have numerous travelers stay for 4 nights but they never seem to do the same things because there is just so many to choose from. Some people make it all about the outdoors and hike the Incline, take the Cog up Pikes Peak, wonder through Garden of the Gods, or explore any number of the other local trails. Some people come of the museums, art galleries, and shopping or a combination of all of those. Everything is within walking distance of our bed and breakfast! Our guests park their cars and don’t back in them for the whole weekend sometimes! We are immensely close to restaurants, art galleries, and shopping. Some people even start their hike to the top of Pikes Peak or the Incline from our front door! The Manitou Springs Chamber of Commerce has a very good website set up at Manitousprings.org. We also have visitor guides in all of the rooms. We have nine rooms in total. Seven are in the main house and then we have two rooms in the Carriage House for those that would like a more apartment like atmosphere. We do not take pets. We have two dogs, Ollie our Scotty and Zoie our Westie, and a big calico cat named Rena. We have to take into consideration what is best for them. Although they are all very friendly and inviting, they are getting older and we much rather them not get hurt. 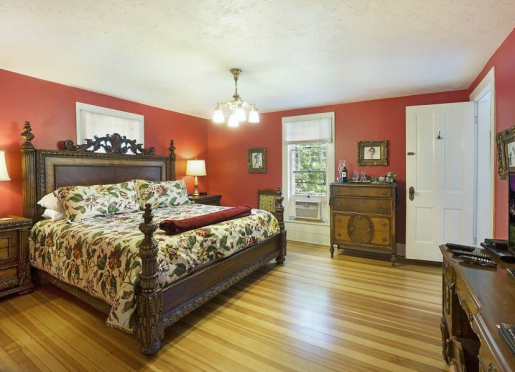 Recently renovated, the Avenue Hotel Bed and Breakfast offers 7 spacious guest rooms, all with private baths. Soak your cares away in one of our antique claw foot tubs/showers. The three story turned staircase in the middle of the house escorts you to the rooms, each with unique updated decor and family heirlooms that add charm and distinction to the Inn. Rooms have King and Queen beds, sitting areas and a variety of views. 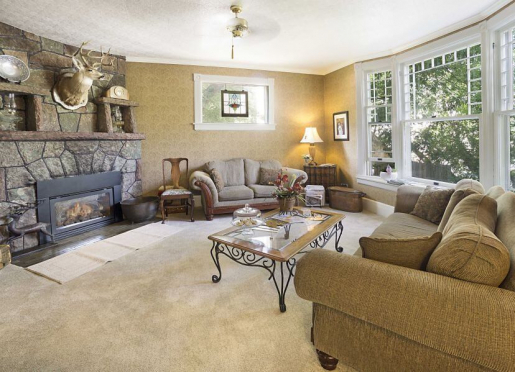 Two large parlors invite you to relax in front of the fireplace or enjoy the bay window and mountain views. Wake hungry and enjoy a scrumptious full breakfast prepared each morning filling enough to carry you through the day. Part of our historic property is a 2 unit Carriage House with fully equipped kitchen that offer additional space and privacy for family vacations or extended stays. 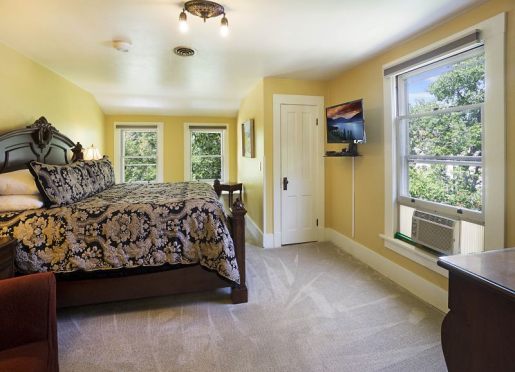 Both are one bedroom with Queen Beds the Upper Carriage House opens to a living room with black iron gas stove fireplace, it has a bath with claw foot tub/shower and the kitchen dining area has mountain views. 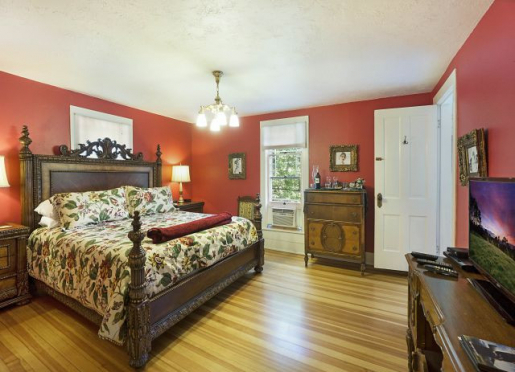 The garden level Carriage House sleeps 4, a trundle bed is neatly arranged in the living room which provides extra seating as well as comfortable sleeping. The kitchen/dining area looks out on the flower garden. Large bright bath with a claw foot tub/shower. We have a wonderful large front yard and our living room & library rooms are ideal for your next function. 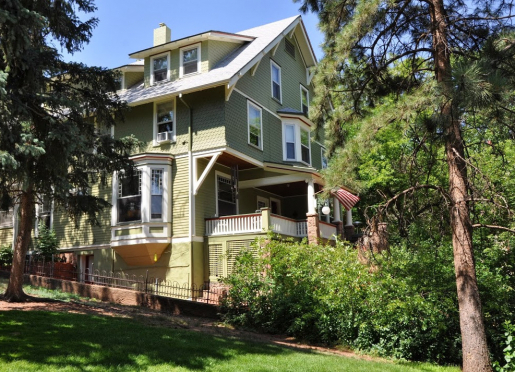 The Avenue Hotel Bed and Breakfast is a great starting point for your adventure, enjoy the many area attractions in Manitou Springs, such as Pikes Peak and the Cog Railroad, Garden of the Gods, Manitou Cliff Dwellings, and Cave of the Winds. Outdoor enthusiasts can enjoy local hiking, biking, horseback riding, golfing, and fishing. In Colorado Springs just east 4 miles an easy drive to Cheyenne Mountain Zoo, Helen Hunt Falls, Seven Falls, Olympic Training Center, Old Colorado City, or Colorado Mining Museum. Visit the US Air Force Academy, Fort Carson, Colorado College, Pikes Peak Community College and University of Colorado at Colorado Springs (UCCS), Colorado Christian University, Focus on the Family, World Prayer Center, St. Mary' Catholic Cathedral, Glen Eyrie just to name some of the local things to fill your days in the Pikes Peak region. Avenue Hotel is a wonderful vacation retreat located in the Rocky Mountain foothill region of Pikes Peak, Home of Pikes Peak Cog Railway and Pikes Peak Highway, just 4 miles west of Colorado Springs, Colorado. We strive to make your Colorado Vacation, Weekend Getaway a special travel experience.